Water temperatures reaching as high as 93 degrees Fahrenheit in Southeast Asia’s Andamann Sea have led to a large die-off of coral reef off the coast of Indonesia, the Wildlife Conservation Society (WCS) reported earlier this week. The abnormally high ocean temperatures lasted for about a month, the report said. Surveys conducted in May, when temperatures started to peak, revealed that more than 60 percent of corals off the coast of the Aceh province in Indonesia had bleached an subsequently died. Subsequent monitoring by marine ecologists earlier this month revealed that up to 80 percent of some coral species had died since the first assessment in May – one of the most sudden and severe coral die-offs ever recorded. More colonies of coral are expected to bleach and die in the coming months, said Caleb McClennen, the WCS director of marine conservation. 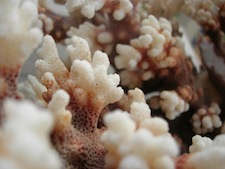 Coral bleaching happens when algae that normally lives within the coral is ejected. It is the algae that gives healthy coral their vibrant colors. Bleaching is an indication of environmental stress, such as variations and warming of sea surface temperatures. The research report released by the WCS this week is based on surveys conducted with scientists from James Cook University in Australia and Syiah Kuala University in Indonesia. The massive bleaching event was a surprise for researchers, McClennen said. Many of the now dead coral had survived significant environmental stresses in the past, including the 2004 Indian Ocean tsunami.